The funeral eulogy of Senator Edward Kennedy was delivered on August 29th, 2009, at Our Lady of Perpetual Help Basilica in Roxbury, Massachusetts, by President Barack Obama. 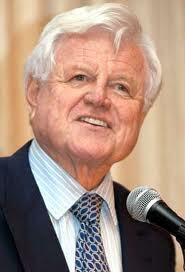 Edward Kennedy (often called Ted) died after a long battle with a malignant brain tumor. His death was seen as the end of the political era that was marked by the Kennedy vision for the Democratic Party and for the future of America. Senator Kennedy served in his position for forty seven years, and at the funeral there were many people who attended to say farewell to the man. Among these were former presidents Jimmy Carter, Bill Clinton, and George Bush. The marked presence of all those who came to pay their respects attested to his diligence and service as a member of the Senate.